Clothing/Jewelry Description A black leather jacket, blue jeans, and a black or red pullover shirt. Medical Conditions Scobie suffers from fibromyaglia, a condition that causes widespread chronic pain, depression and abnormal sleep patterns. She was taking muscle relaxants at the time of her disappearance. Distinguishing Characteristics Caucasian female. Brown hair, blue eyes. Scobie has a four to five inch scar on her right elbow and forearm, and a small scar above her left eyebrow. She may use the last names Vickers and/or Barfield. Scobie had highlights in her hair at the time of her disappearance. Her ears are pierced and three of her back teeth are missing. 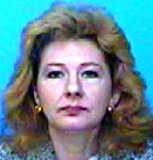 Scobie was last seen by her family at approximately 10:00 p.m. on March 29, 2003 in Enterprise, Alabama, at Amazonos, formerly known as Bucks. At 5:00 p.m. on March 30, she was sighted at a grocery outlet. Scobie was never heard from again after that. Her family reported her missing on March 31, two days after they last saw her. Some reports say Scobie boarded a northbound Greyhound bus at the station in the vicinity of 500 block of east Park Avenue in Enterprise. Foul play is not suspected in her disappearance, but few details are available. Daleville, Alabama authorities are investigating. Updated 2 times since October 12, 2004. Last updated March 11, 2008; medical conditions added.